Timb-A-Tilt is a complete hardware system from Caldwell which allows for the production of high quality, timber vertical sliding windows with an integrated tilt back facility. This in built tilting facility allows the end user to carry out easier window maintenance and cleaning, as it can be carried out from the inside. Whilst Timb-A-Tilt hardware provides greater levels of convenience, it also manages to maintain the aesthetic of traditional sliding sash windows, offering the best in both functionality and appearance. 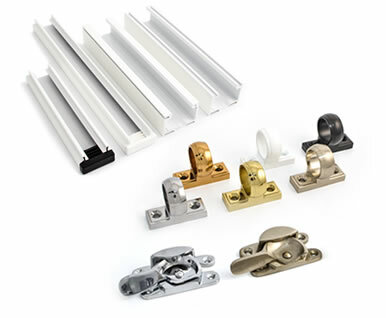 To provide a comprehensive range of hardware products for tilting sash windows, our Timb-A-Tilt hardware solution includes a variety of tilting sash window components to satisfy aesthetic and performance requirements for virtually any project. Including spring balances (Alumatilt, Ultralift, Torso) to accommodate sashes up to 50kg in weight, and pivot shoes and pivot bars to facilitate the tilting function, Timb-A-Tilt hardware encompasses a range of hardware to create a fully functioning tilting timber sash window. Additionally we can provide a selection of brass hardware accessories to create a look which is traditional, but also functions to a very high level.